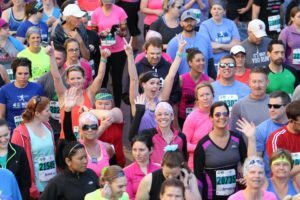 Social Groups allow people to participate in any of the Amway River Bank Run event distances all under one umbrella while saving $5 on each registration. Anyone can establish a Social Group – companies, nonprofits, churches, schools, group of friends – with no extra fee and then recruit the members they would like to join them on Saturday, May 11. Once a Social Group has been created online, the admin receives a unique URL to share to have them join their group. For 12 and younger participants, please email us for a discount code. Social Groups can be created with a minimum of 10 participants and an unlimited amount of people to join. Each participant is scored individually in their age group. Sign up your group today!